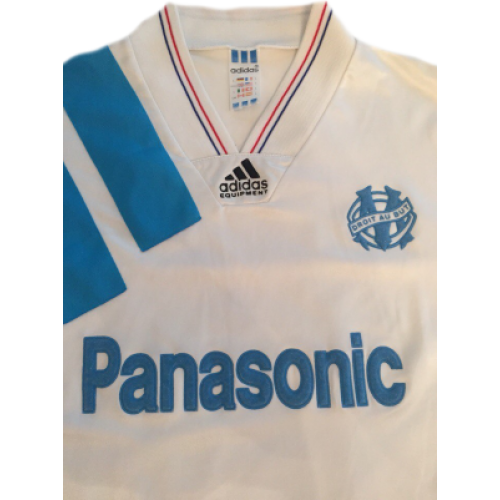 This Olympique Marseille retro shirt home 1992-1993 with Panasonic sponsor was used of players like: Abedi Pele, Deschamps, Basile Boli, Rudi Voller and others. 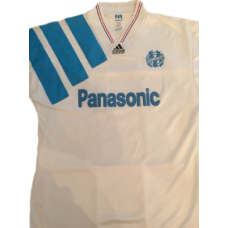 Marseille won French Division 1, and also became the first (and, to date, only) French club to win the European Cup defeating A.C. Milan 1-0. 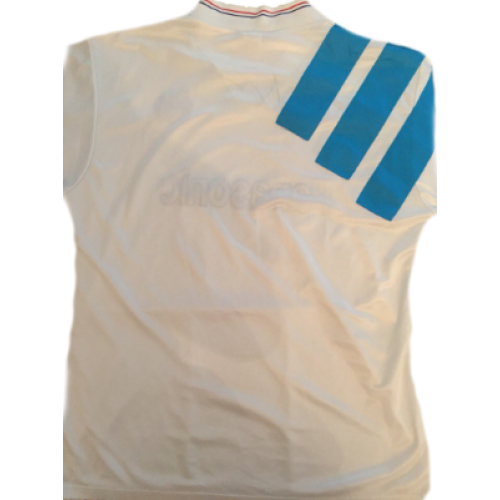 However, it was later revealed that midfielder Jean-Jacques Eydelie had (on behalf of the Marseille board) bribed Valenciennes players Jorge Burruchaga, Christophe Robert and Jacques Glassman to lose the last match of the season, which Marseille needed to win the secure the French title, so that Marseille could win the match without much exertion ahead of the Champions League final. The scandal saw Marseille stripped of their title, relegated to Division 2 and banned from defending the Champions League or competing in the European Super and Intercontinental Cups, although they were allowed to remain European champions.